These bangles are made out of aluminum and the chain and clasp stainless steel. Neither metal will change color. They also do not contain lead or nickel. 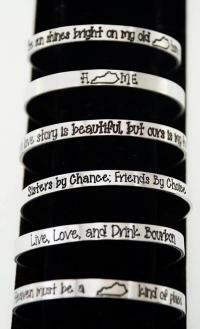 Bangle fits regular wrist sizes and is adjustable with a clasp. "The sun shines bright on my old (ky shape) home"
"Every love story is beautiful but ours is my favorite"
"Sisters by Chance; Friends by Choice"
"Heaven must be a (ky shape) kind of place"